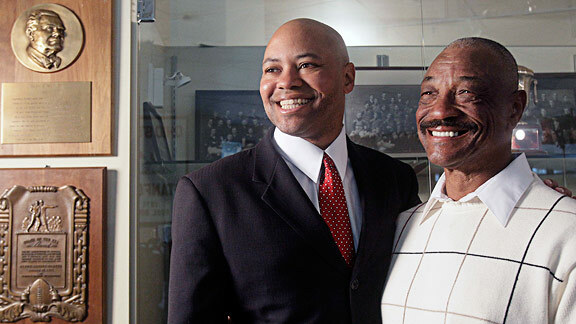 AP Photo/Jeff Chiu David Shaw and his father, Willie, savor the moment after David was named Stanford head coach. David Shaw must be the envy of much of the college football world right about now. In assuming his first head coaching job this season, he inherits a Stanford team coming off a 12-1 season and a convincing BCS bowl victory ... and he gets to keep star quarterback Andrew Luck under center. The opportunity has even greater significance for Shaw, however, considering that he played for the Cardinal from 1991-94, and his father, Willie, served two stints as an assistant coach for the program. But make no mistake -- this is a role that Shaw earned by climbing the assistant coaching ladder for a decade and a half in the college and NFL ranks after earning his sociology degree from Stanford in 1995. Since Shaw worked as Stanford's offensive coordinator for the previous four seasons, the move provides valuable continuity for the team as well. Page 2: What kind of pride do you take personally in becoming head coach at your alma mater? Shaw: I feel a lot of responsibility that I relish. I enjoy it. I like that it's put on my shoulders to make sure that we run a good program. Make sure that our kids play hard. Make sure our kids appreciate being at Stanford University and all that it entails -- academically and socially, as well as athletically. I feel a lot of responsibility to put a product on the field that the alumni are going to be proud of, because that was what I looked for when I was an alum before I got back to Stanford. I wanted to see a product on the field that I could look back and say, "You know what? I love what those guys are doing." I wanna do that for our fans and for our alumni. What coach has influenced you the most? Kind of a mix. Denny Green was just consistent. Every single day he was gonna be energetic, he was gonna be paying attention to details. Bill Walsh came in, and we were gonna attack people specifically. Every single play had a specific reason, whether it was attacking a player or attacking a scheme. Brian Billick was ridiculously organized and structured. He put together a team and a way of practicing that was very conducive to us being successful. Jon Gruden taught me how to think critically and taught me how to be selective in how we did what we did and how we taught our players. Bill Callahan taught me the running game and protections, and I lean heavily on that education. Then my dad, being a guy that coached for such a long time and had such a high level of respect from the players and other coaches. I want to have that same effect on people as well. ... I learned a long time ago that you don't have to do what other people do, but you've gotta learn something from everybody. If you could take a mulligan on any coaching decision you've ever made, what would it be? You don't wanna take anything back, because everything is a learning experience. If you call a play that doesn't work, boy that memory stays with you, and it makes you a better coach afterward. I've called plays that have led to interceptions, whereas we'll come back and use that play in a different situation against a different team and it ends up being a touchdown. So every stumble in the road ends up being a building block for your future as a coach. Does that shiny Orange Bowl ring on your finger help seal the deal with recruits? Page 2 interviewed each of the Pac-12's head football coaches during their recent pilgrimage to ESPN headquarters. What did your coach have to say? They did a great job putting this ring together with the diamonds and everything. It signifies a lot of hard work. Our team did a phenomenal job last year, and they came to play when the lights were on. That's the message to our team is you've gotta put in the hard work first. It's gonna be tough. It's gonna be physical. Nobody's gonna see you doing it, and then when it's time to play on the big stage, you've gotta perform. Are you guys bringing back the black jerseys this year? They will make a new appearance this year as well. ... It's new. It's fun. It's exciting. I worked with our Nike representative on this a few years ago and pitched it to Coach Harbaugh, and we didn't know how he was gonna feel about it. He got excited about it, so we did that last year, and we'll do the same thing this year. We're also in with Nike for a special game at the end of the year where we'll break with tradition a little bit. Not too far from tradition, but we'll have another uniform for the end of the year. It's been announced by Nike. It hasn't been shown yet, but I believe they'll do that sometime in September. How much did your first coaching job pay? I wanna say $7,000 for the year -- Western Washington University. ... I was going to be a [graduate assistant], but there was so much work to do I never actually went to graduate school, so I will say [the title was] coach's assistant. Whatever the coaches needed me to do, that's what I did. Not counting your school, which Pac-12 university has the most attractive cheerleaders? I wouldn't know. On game day, I'm so focused. I'd like to be able to answer you. I'm sorry, I just couldn't give you an answer. ... I'll try to look next year. I'll try to pay attention. Not counting your school, which Pac-12 university has the best mascot? I'm an old-school guy. I think Tommy Trojan is great. I think the pregame stuff is good for college football. My uncle [Nate Shaw] was an All-American at SC, and I grew up watching [Tommy] ride around on [Traveler]. Not counting yourself, who's the best dressed coach in the conference? There's no question it's Lane Kiffin. The rest of us coaches believe his wife does a nice job picking out the duds for him to wear. Which opposing player are you most glad you no longer have to face? Stephen Paea, Oregon State [defensive tackle]. What song or performer is on your iPod that might surprise people? "The Doors, Jay-Z, Sade and Stevie Wonder -- all in the same mix." What's your favorite restaurant anywhere? St. Elmo's Steakhouse in Indianapolis. ... It's the only place I'll go medium. Everywhere else, I'll [have them] char it. But a medium steak at St. Elmo's is unmatched to me. Jerry Rice, which is funny because I actually ended up coaching him in his first year with the Oakland Raiders. ... It was a dream come true just to be around him. I hesitate to say I coached him. I was around him, and I asked him more questions than he asked me. There's no secret to [his] success. The guy works his tail off every single day. At age 40, he was the best player on our team. He and Rich Gannon kind of set the tone, and Tim Brown was still playing at a high level. But to see Jerry come in at age 40 and just put on a show was awesome. Outside of Palo Alto, and I love being in Palo Alto -- Italy. ... I love the history. I love sculpture. I love walking through the various cities and seeing artwork by Michelangelo, Donatello and Leonardo da Vinci. The place just breathes history. I love the B.C. history there as well. I think it's phenomenal -- the old Roman stuff. I love the Colosseum. I love Venice. It's just an awesome place to be. Cap. I've had a sunburn on top of my head before, and I won't let it happen again. What's a hobby or recreational passion of yours that might surprise people? Up until recently, it's been basketball. I love playing pickup basketball games. Now, the level I play at, I practice with my 8-year-old daughter and my 6-year-old son. That's the level I'm at right now, since I don't have time to play enough. I love teaching them the game, and just playing basketball with those two. Didn't you appear in a varsity hoops game for the Cardinal back in the day? I did. One game against Oregon State. ... We had a couple players transfer out and leave the team, so we had nine guys on the team. My roommate was a basketball player, Brent Williams. He was a starter on the team, and I jokingly said, "Hey, tell Coach Montgomery if he needs a 10th guy just to get through practice, then I'm available." We just finished the [football] season, and we're getting into our winter conditioning. Coach Montgomery comes back and tells Brent to tell me to come talk to him. I talk to him and get it cleared with Bill Walsh. So I joined the team as a practice player. What I didn't know was that you can't be a practice player and still play intramural basketball. So they kicked me out of intramural basketball. I told Coach Montgomery, "I don't have any intramural responsibility; I'm [just] doing my football lifting, so whatever you need me to do, I'll do." The first game I actually put on a warm-up uniform for was the Cal game. I didn't have a jersey on underneath it. I just had on the warm-up uniform. I went through warm-ups and had a blast. ... The next home game was against Oregon State. Coach Montgomery, God bless him, he gave me a uniform. I wore No. 21, and we were blowing 'em out. I had a football cheering section, and just like the movie "Rudy," everybody starts cheering my name. Montgomery comes down -- and I'm at the end of the bench -- and he says, "Do you wanna play?" I said, "You better believe it." So he put me in, and I got a minute and a half. In the first 10 seconds on the court, I got a rebound. So I have one NCAA stat, and it was phenomenal. Did you get to take a shot? I didn't get a shot off. I got the rebound and kicked it to the point guard. I filled in the lane, and I just knew he was gonna shoot me an alley-oop and I was gonna throw it down. He kinda gave me the look like he was about to throw it. He faked the pass and took a shot. By the time we got the ball back, there wasn't enough time.